Feeney, Shane Morrin, Sinead T. Joshi, Lokesh and Hickey, Rita M. 2018. Novel Proteins for Food, Pharmaceuticals and Agriculture. p. 291. Anema, Skelte G. 2017. A comparison of the kinetics of the thermal denaturation of the immunoglobulins in caprine and bovine skim milk samples. International Dairy Journal, Vol. 65, Issue. , p. 1. Dugnol, Julia and Riera, Francisco A 2016. 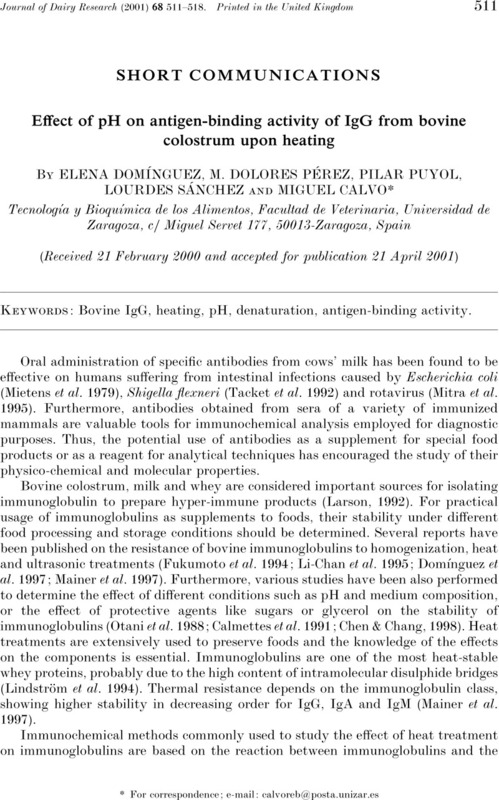 Hyperimmunised bovine milk and whey: influence of pH and enzymatic treatments on the antigen-binding capacity of immunoglobulin G. Journal of the Science of Food and Agriculture, Vol. 96, Issue. 5, p. 1814. Pereira, R.V. Bicalho, M.L. Machado, V.S. Lima, S. Teixeira, A.G. Warnick, L.D. and Bicalho, R.C. 2014. Evaluation of the effects of ultraviolet light on bacterial contaminants inoculated into whole milk and colostrum, and on colostrum immunoglobulin G. Journal of Dairy Science, Vol. 97, Issue. 5, p. 2866. Riera, Francisco Alvarez, Alejandro Espi, Alberto Prieto, Miguel de la Roza, Begoña and Vicente, Fernando 2014. Cow's milk with active immunoglobulins againstCampylobacter jejuni: Effects of temperature on immunoglobulin activity. Journal of the Science of Food and Agriculture, Vol. 94, Issue. 6, p. 1205. Riera, Francisco and Álvarez, Alejandro 2014. Influence of temperature and pH on the antigen-binding capacity of immunoglobulin G in cheese whey derived from hyper-immune milk. International Dairy Journal, Vol. 37, Issue. 2, p. 111. Hurley, Walter L. and Theil, Peter K. 2011. Perspectives on Immunoglobulins in Colostrum and Milk. Nutrients, Vol. 3, Issue. 4, p. 442. Holland, Patrick T. Cargill, Anne Selwood, Andrew I. Arnold, Kate Krammer, Jacqueline L. and Pearce, Kevin N. 2011. Determination of Soluble Immunoglobulin G in Bovine Colostrum Products by Protein G Affinity Chromatography–Turbidity Correction and Method Validation. Journal of Agricultural and Food Chemistry, Vol. 59, Issue. 10, p. 5248. Sathya Devi, V. Coleman, Denis R. and Truntzer, Jeremy 2011. Thermal Unfolding Curves of High Concentration Bovine IgG Measured by FTIR Spectroscopy. The Protein Journal, Vol. 30, Issue. 6, p. 395. Morales-delaNuez, A. Moreno-Indias, I. Sánchez-Macías, D. Capote, J. Juste, M.C. Castro, N. Hernández-Castellano, L.E. and Argüello, A. 2011. Sodium dodecyl sulfate reduces bacterial contamination in goat colostrum without negative effects on immune passive transfer in goat kids. Journal of Dairy Science, Vol. 94, Issue. 1, p. 410. Zhukovsky, Mikhail A. Basmaciogullari, Stéphane Pacheco, Beatriz Wang, Liping Madani, Navid Haim, Hillel Sodroski, Joseph and Schwartz, Olivier 2010. Thermal Stability of the Human Immunodeficiency Virus Type 1 (HIV-1) Receptors, CD4 and CXCR4, Reconstituted in Proteoliposomes. PLoS ONE, Vol. 5, Issue. 10, p. e13249. Gao, Wei Chen, Long Xu, Long Bing and Huang, Xin Hua 2010. Specific IgG activity against diarrheagenic bacteria in bovine immune milk and effect of pH on its antigen-binding activity upon heating. Journal of Dairy Research, Vol. 77, Issue. 02, p. 220. Indyk, Harvey E. Williams, Jacob W. and Patel, Hasmukh A. 2008. Analysis of denaturation of bovine IgG by heat and high pressure using an optical biosensor. International Dairy Journal, Vol. 18, Issue. 4, p. 359. De Luis, R. Pérez, M.D. Sánchez, L. Lavilla, M. and Calvo, M. 2008. Kinetic and Thermodynamic Parameters for Heat Denaturation of Cry1A(b) Protein from Transgenic Maize (Zea mays). Journal of Food Science, Vol. 73, Issue. 6, p. C447. Gapper, Leyton W. Copestake, David E. J. Otter, Don E. and Indyk, Harvey E. 2007. Analysis of bovine immunoglobulin G in milk, colostrum and dietary supplements: a review. Analytical and Bioanalytical Chemistry, Vol. 389, Issue. 1, p. 93. Trujillo, A.J. Castro, N. Quevedo, J.M. Argüello, A. Capote, J. and Guamis, B. 2007. Effect of Heat and High-Pressure Treatments on Microbiological Quality and Immunoglobulin G Stability of Caprine Colostrum. Journal of Dairy Science, Vol. 90, Issue. 2, p. 833. Stefaniak, T. 2006. Biology of Nutrition in Growing Animals. Vol. 4, Issue. , p. 285. Li, S-Q. Zhang, Q.H. Lee, Y-Z. and Pham, T-V. 2003. Effects of Pulsed Electric Fields and Thermal Processing on the Stability of Bovine Immunoglobulin G (IgG) in Enriched Soymilk. Journal of Food Science, Vol. 68, Issue. 4, p. 1201.